Along with Sibella Kraus, Tom Sargent was one of the founding board members of the San Francisco Public Market Collaborative, the organization that started the Ferry Plaza Farmers Market in 1993 and eventually evolved into CUESA. He is an urban planner, developer, and founding principal at Equity Community Builders. While several events and circumstances came together to inspire the creation of the Ferry Plaza Farmers Market, it was the 1989 Loma Prieta earthquake that fortuitously set the stage, by damaging the much-maligned Embarcadero Freeway beyond repair. As a result, the iconic Ferry Building, at the center of the City and the terminus of Market Street, reclaimed its rightful and central urban role, after more than 30 years hidden in the shadow of the indisputably ugly and noisy double-decker freeway to nowhere. After the freeway was demolished in 1991, an open space of more than four acres—full of light, air, and extraordinary views—was created in front of the formerly grand landmark façade, then paved over as temporary parking lots. Despite the urban drama of this new space, few people had visited it, even though it is the focus of the city’s historic street grid. It was a vast urban stage waiting to be animated again. During the 1980s, interest in organic and sustainably farmed local food started to reach a critical mass in the Bay Area, creating a celebrity culture around chefs and farmers, particularly those farmers who understood that selling fresh food was as much about beauty, health, and relationship as it was about production and yield. There were well-established local farmers markets in the Bay Area, but none that was capturing the enthusiasm and loyalty of a new breed of shoppers who were just beginning to understand the taste and quality of locally grown, certified organic fresh foods. Granville Island Market had recently opened up in Vancouver as a living model of what a modern “public market” could look and feel like, and gave those who visited it a new visual and economic vocabulary for a vibrant and community oriented way of shopping and creating an active town square in the heart of the city. Inspired by the opportunities to create a similar public market on the waterfront in San Francisco, a small group of people came together in 1992 to form the San Francisco Public Market Collaborative, which preceded CUESA. 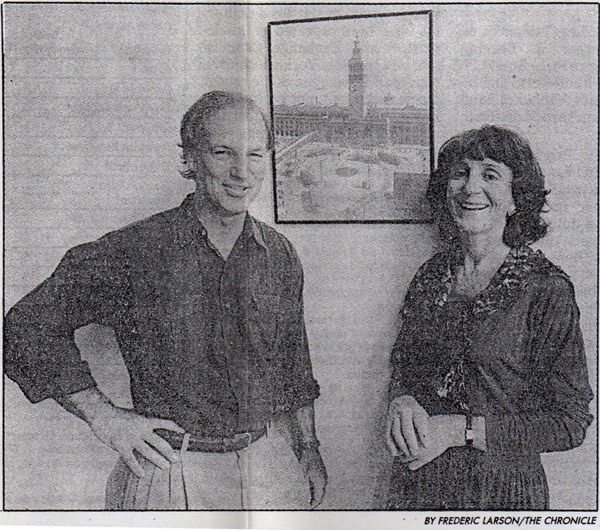 The core group included Joe Weiner (who actually had the original idea for a waterfront market but passed away that year), Sibella Kraus, and myself. Quickly a larger board of directors was assembled of local chefs and restaurateurs (Susan Walter, Patricia Unterman, Larry Vito, Larry Mindel); farmers (Judith Redmond); architects and city lovers (Beverly Mills, Marie Zeller, Leon Sugarman, Andria Knapp), and market vendors (Bill Fujimoto, Paul Johnson). Sibella took on the role of executive director. The group focused on initially creating an outdoor European-style fresh food market in the newly constructed parking lots in front of the Ferry Building. However, the ultimate goal was always for a 50,000 square foot, seven-day public market, with a fully developed educational program about sustainable agriculture and local farm-to-city connection. We assembled a presentation to the Port Commission that included inspiring slides of some of the best outdoor markets in the world. On the day of the presentation, we assumed that the Commission would enthusiastically endorse our civic-minded proposal to activate its current eyesore in front of the Ferry Building. After hearing positive comments of support from the Port staff, a highly respected and long-serving commissioner looked us over and said simply: “I don’t want any of your damn lettuce on our parking lots.” And that was the end of the discussion. The conclusion was no farmers market on Port property, which seemed ironic given the Port’s important role in the development of California’s global agricultural economy. We had already lined up the farmers, restaurant stalls, other food purveyors; printed posters, and scheduled volunteers for a September Harvest Market. We regrouped, went back to the Port staff and told them we had changed the focus of the event to a one day “Celebration of the Port of San Francisco.” For some reason, this notion got approved, despite the possibilities of lettuce on the new pavement. On that morning I remember standing in the parking lot around 6 am, where we had marked the stall locations and put up yellow canopies, wondering if anyone would show up. We moved the trucks into place, the produce and product came out on the tables, and people started to meander into the market. All day long they came. The estimates range from 7,500 to 10,000 people that day, but we gave up counting. It was glorious and too much fun. After the success of that day, the conversations with the Port staff and commissioners were quite different. It was clear that a fresh food market with an active educational program could regularly draw people to the waterfront in ways that no one had imagined. The market became a destination landmark in itself. The Collaborative then took on the task of trying to envision what a permanent market would look like. With the able help of architect Leon Sugarman, we developed proposal after proposal of a large indoor market in and around the Ferry Building (which was largely vacant on the first floor at that time) and other nearby locations along the waterfront. These efforts continued unabated until the Port ultimately settled on the current plan of a full-scale indoor market on the first floor of the Ferry Building complemented by an outdoor Ferry Plaza Farmers Market in the front arcades and back plaza, as it is today.